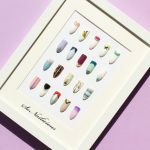 Good Nail Strengthener: technically it’s not a nail art item, but a great manicure requires a good base, plus you need to keep your nails protected and nourished at all times, even while sunbathing. My all time favourites are Orly Nailtrition and Mavala Mava-Strong. They also come in mini size, which is perfect for travelling. White Nail Polish: the perfect base for any kind of nail art and the most popular summer colour, white is an essential nail polish to bring along on your vacation. Just by using white and a few nail art accessories you can create countless nail designs easily. Here’s a few brilliant white nail art ideas. Black Nail Polish: just like white, black is another essential nail colour to have in your travelling nail art kit. Even if you only bring black and white polishes, you still will be able to create a variety of fabulous nail designs. Here’s a few ideas. Glass Nail File: it’s a ‘must-bring’ item! A small glass file is perfect for a carry on luggage and will save you from a potential embarrassment of vacationing with a broken nail. Clean up Nail Art Brush: ideally you should be able to paint your nails flawlessly, but realistically, we all make mistakes. So make sure you pack your clean up brush… you never know who’s watching (maybe it’s me sitting checking out your nails!) and you want your manicure look flawless, right? Detailing/Liner Nail Art Brush: depends on your nail art style either bring your a good striping or detailing nail art brush. I usually bring both, just in case. 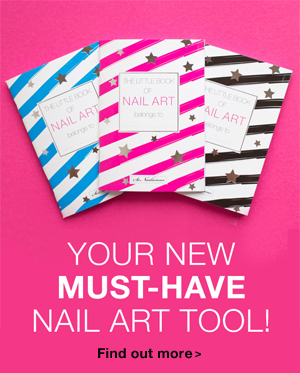 Nail Stickers: self-adhesive nail stickers are perfect for a quick nail art on the go. Because who wants to sit inside a hotel room and paint nails for hours while on vacation! Plus, stickers are super light and tiny, they won’t add any weight to your bag. At the moment I’m enjoying the new Aztec sticker range, they are perfect for summer. Good Top Coat: …and not just a good one, you need an excellent one for a vacation! So pack your favourite fail-proof and fast drying top coat, – you don’t have time for waiting for your nails to dry or fighting with bubbles. You need a top coat that works. Under any circumstances. My favourite at the moment is Caption top coat, but here’s a few other great options, just in case. Favourite Nail Colours: either bring your all time favourites or new colours that you’ really wanted to try but didn’t get a chance yet. It makes sense to bring nail colours in pairs that work together well (for a potential nail art). If you’re bringing more than 2 nail polishes, check out these tips on how to pack your nail polish for a long trip. Extra Tip #1: another great nail art item to bring on a vacation is a Silicone Tool, it’s great for creating smooshy and drag marble manicures, applying stickers, foil, glitter or even shells. 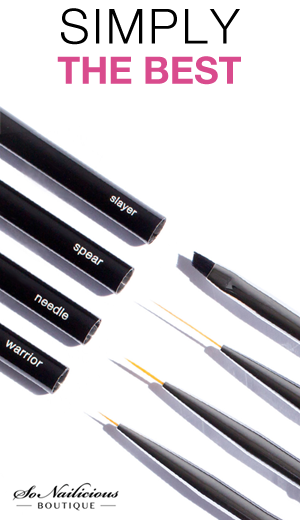 It also can be used to clean up around cuticles and even as a detailing nail art brush. Extra Tip #2: Leave polish remover at home and instead bring a nail polish remover wipes. It’ll save some space and weight in your bag. Plus, it’s something that you can bring on board in your carry on luggage and use anywhere anytime (even on a plane if you wish). Wipes don’t smell! What about you, nail art warriors? 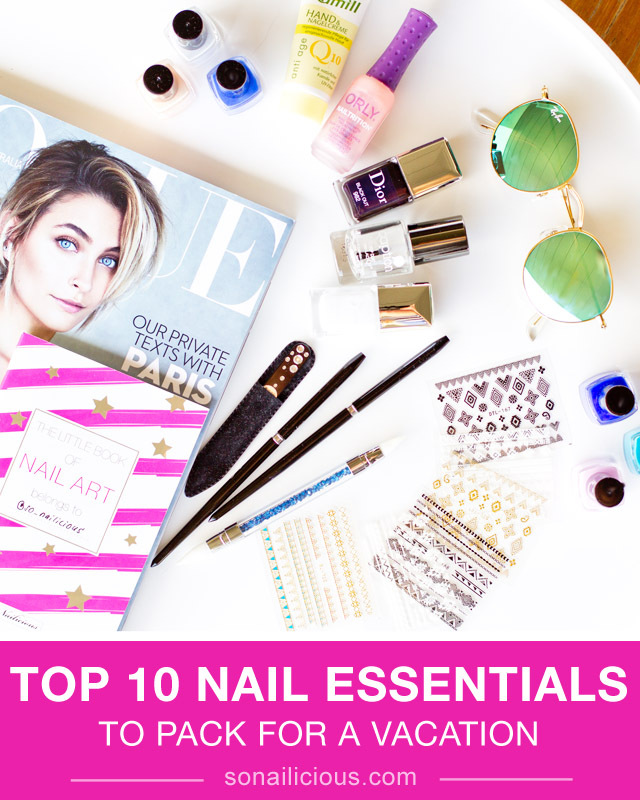 What nail art essentials do you usually take travelling with you? Share with me, I’d love to know! PS. Not going on a quick trip any time soon? Make sure you bookmark, pin or save the above tips for the future! This is my second post from #SoNailiciousVacay series. Want to know what’s the best nail colour to wear while vacationing? See it here. 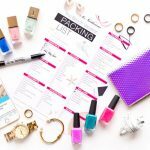 Also, check out these super useful Printable Packing Lists – free download! And if you need some suggestions on space-saving, high performance nail care, here’s the best nail care products for travelers.